The Mahabharata – sometimes considered the fifth Vedda – is longer than the Odyssey and the Iliad combined, and its influence rivals that of the Bible and the Quran. Though ranked high among the world’s most ambitious and absorbing works of literature, it hasn’t always been among the most accessible. 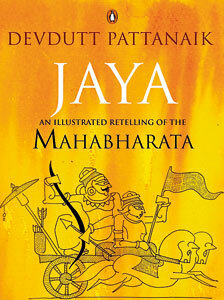 Yet, Devdutt Pattanaik’s ‘Jaya: An Illustrated Retelling of the Mahabharata’ was published late last year to near universal acclaim. It’s possible that the clarity and brevity of his prose was simply more readable than that of his competition – one rival translation is divided into 12 weighty volumes, while another is written entirely in rhyming couplets; the version children are routinely introduced to is purged of its explicit content and simplified to the point of inanity. But Devdutt embraces the moral ambiguity inherent in the Mahabharata and in doing so sets himself apart. The climax of the Mahabharata is the terrible clash of the Kaurava and Pandava clans in an epic battle – but sub-plots proliferate and the epic is populated with a cast of hundreds, each with their own individual histories that span centuries of rebirths. At the very heart of this 3,000 year old epic is the Bhagavad Gita. The words, spoken by Krishna to Arjuna on the battlefield, are widely quoted as the very essence of Vedic wisdom. Devdutt has described himself as ‘a medical doctor by education, a leadership consultant by profession, and a mythologist by passion.’ As an author his work is overwhelmingly inspired by the rich tradition of Hindu literature. Aside from ‘Jaya’ there’s also ‘The Book of Ram’ ‘Myth = Mythya: A Handbook of Indian Mythology’, ‘The Pregnant King’ and the ‘Book of Kali’. For him, their lessons find surprising resonance in the field of management. As the Chief Belief Officer of the Future Group, one of India’s biggest brands, he’s in charge of inventing a whole new vocabulary for his company, one that relies heavily on myth and legend. He describes it as applied mythology. An example of his thinking is ‘LSD’, where the three Indian ‘currencies’ are embodied in the three aspects of the Goddess – Lakshmi, Saraswathie and Durga. Applied to the workplace, each represents a facet of employee satisfaction. Lakshmi is wealth; Saraswathie, intellectual stimulation and then there’s Durga – the part of us that needs emotional security to perform our best. “These currencies can make you happy in different proportions…At crisis points L,S and D collapse – we become insecure, we become poor and we don’t have imagination,” he says speaking of the ways in which a good manager nurtures an employee. Tags: Bhagavad Gita, Devdutt Pattanaik, Durga, Lakshmi, Mahabharata. Bookmark the permalink.